If you looked at the tour of our last house or our Apartment Therapy tour, you may have noticed the beautiful space we had for a playscape. We weren’t sure when we’d be moving, so in a bit of bad timing, we bought he girls a playscape as a joint birthday gift. That involved cutting down trees, rerouting irrigation, moving large limestone blocks, digging up huge bushes, leveling, paying sod… It was a lot of work and we just did it last November. Imagine our joy when we found a great house that would need a similar project! It was a nice spot, but the grassy area happened to be the exact size of our playscape which did not allow for room to love and play. Of course we have other plans! This seemed like the perfect hump-day post since it feels like we are at the hump of this project. We’re at that point where the first phase of the work is finished, but now we have to clean everything up and put it back together. Here’s what we’ve done so far. First, we had the rare luck of being able to “make” more yard by moving the fence. It’s technically a side fence but is quite a way back from the side property line, partly due to terrain. 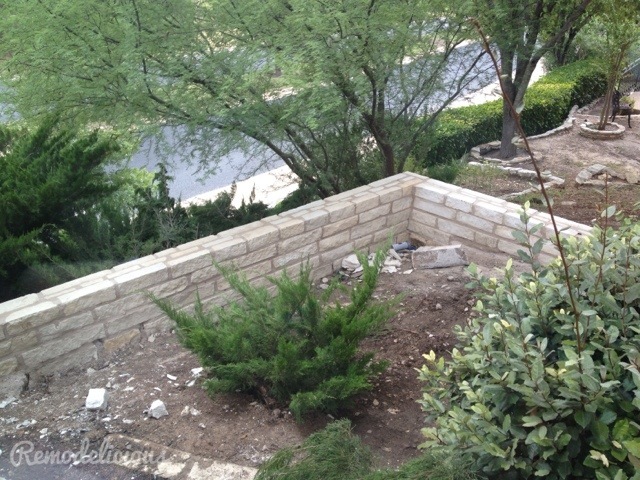 We picked a spot where we could put a small retaining wall to level out this space within reason (without major engineering & structural concerns) and hired a mason. Yay, more yard! 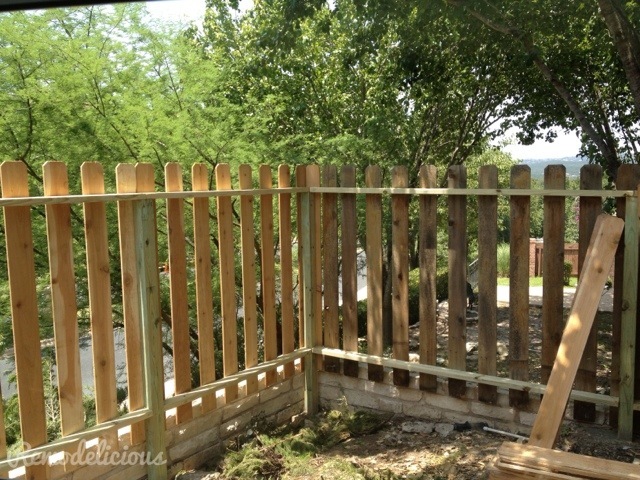 Then we had to take down the section existing fence and fence in the new area. In the middle of summer. In Texas. So glad we have a pool! I wish we could take complete credit for this, but we did hire-in a laborer that we’ve used before because this was a lot of work that we wanted to get done quickly. He has also built a lot more fences than Jason & I have! 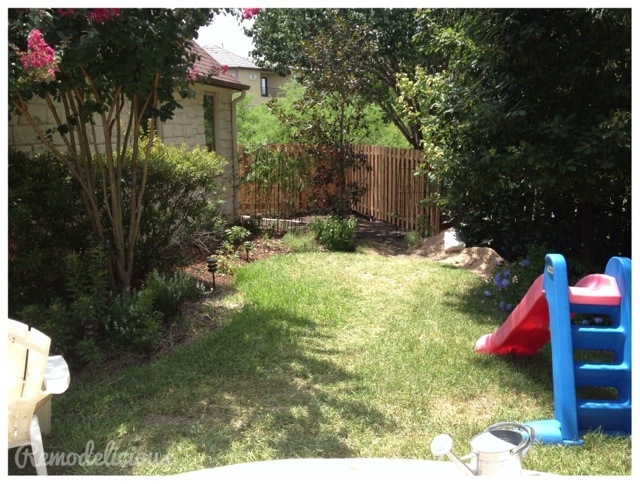 Once we leveled out the area using existing dirt from the overly-built-up flower beds, it really looked like more yard! We are also moving & removing some plants. Here’s a progress photo with some of the overgrowth removed. Finally, reclaiming this totally un-used space. Impressive temporary slide, yes? Now it’s time to make this area beautiful, safe, and ready for our playscape. It’s getting exciting, but we still have a ton of work to do. I’ll save the way we are finishing everything off as a surprise, and it should be well worth it. Of course, we are going *a bit* over the top. Would you expect anything less from a girl in shiny shoes?